Cement manufacturer Holcim Philippines has signed up its new brand ambassador, whom the company thinks embodies the brand's reliable image. From left to right: Holcim marketing head Ann Claire Ramirez-Tecson; Holcim Philippines CEO and president Eduardo Sahagun; brand ambassador Kim Atienza; and Holcim commercial vice president William Sumalinog. 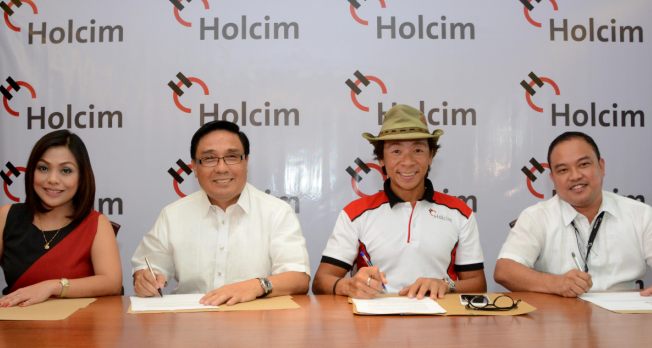 Holcim Philippines, Inc., one of the leading cement companies in the Philippines, has partnered with TV personality and biodiversity advocate ‘Kuya Kim’ Atienza as its new brand ambassador to help promote the company and its products as a trusted choice for this important building material. Eduardo A. Sahagun, Chief Executive Officer and President of Holcim Philippines Inc. stressed the company’s commitment to responsible citizenship and sustainability that values and respects nature. “Holcim Philippines is a company that can be trusted to provide, in a sustainable manner, building solutions for projects crucial to development,” he said. “Holcim’s vision is to provide strong foundations for the society’s future so we put premium on construction efficiency, sustainability, and safety. This is also reflected in our new tagline “Matatag. Matibay. Maasahan. Panatag kapag Holcim” because with us you are assured of products and services that are tried and tested, world-class, and superior in quality,” he said. “Just as people trust Kuya Kim to deliver reliable weather news, the public can count on Holcim Philippines to provide strong and high-performing products that will go a long way in ensuring customer satisfaction due to the dependability of the company’s products,” Cara Ramirez-Tecson, Marketing Head, said. Included in Holcim Philippines’s product catalogue are Holcim Excel, Holcim Premium Bulk, Holcim 4X, and Wall Right. The company also offers a host of cement-based building solutions such as Holcim Skim Coat, Holcim Tile Adhesive, and Holcim Concrete Waterproofing. Holcim Philippines is a member of the Holcim Group, one of the global leaders in the building materials industry that has a strong presence in over 70 countries. The Holcim Group has been operating for more than 100 years and is known for its construction solutions offerings as well as its commitment to sustainability.